This report provides a summary and analysis of legislative proposals that would provide voting representation in Congress to residents of the District of Columbia. Since the issue of voting representation for District residents was first broached in 1801, Congress has considered five legislative options: (1) seek voting rights in Congress by constitutional amendment, (2) retrocede the District to Maryland (retrocession), (3) allow District residents to vote in Maryland for their representatives to the House and Senate (semi-retrocession), (4) grant the District statehood, and (5) define the District as a state for the purpose of voting for federal office (virtual statehood). Early in the 110th Congress, sponsors of two 109th Congress bills introduced new measures. On January 9, 2007, Delegate Eleanor Holmes Norton and Representative Tom Davis introduced H.R. 328. The bill does not include the most controversial provision included in H.R. 5388, namely, the creation of an at-large congressional district for the state most likely to gain an additional representative. That state, Utah, recently approved a fourth congressional district. On January 16, 2007, Representative Dana Rohrabacher introduced H.R. 492, a bill with many of the same provisions included in H.R. 190 (from the 109th Congress). These proposals would grant voting representation by statute, eschewing the constitutional amendment process and statehood option. Any proposal considered by Congress face three distinct challenges. It must (1) address issues raised by Article 1, Sec. 2 of the Constitution, which limits voting representation to states; (2) provide for the continued existence of the District of Columbia as the “Seat of Government of the United States” (Article 1, Sec. 8); and (3) consider its impact on the 23rd Amendment to the Constitution, which grants three electoral votes to the District of Columbia. For a discussion of constitutional issues of proposed legislation, see CRS Report RL33824, The Constitutionality of Awarding the Delegate for the District of Columbia a Vote in the House of Representatives or the Committee of the Whole, by Kenneth R. Thomas. This report will be updated as events warrant. Proponents of voting representation contend that the District’s unique governmental status resulted in its citizens’ equally unique and arguably undemocratic political status. Citizens residing in the District have no vote in their national legislature, although they pay federal taxes and may vote in presidential elections. Opponents often note that the Constitution grants only states voting representation in Congress. They argue that, given the District’s unique status and a strict reading of the Constitution, no avenue exists to provide District residents voting rights in the national legislature other than a constitutional amendment or the statehood process, which could be achieve by statute. Issues central to the District of Columbia voting representation debate arguably revolve around two principles of our republican form of government: (1) the consent of the governed and (2) no taxation in the absence of representation. The debate has also involved questions about how to reconcile two constitutional provisions: one creating the District and giving Congress exclusive legislative power over the District (Article I, Section 8); the other providing that only citizens of states shall have voting representation in the House and Senate (Article 1, Section 2 and Section 3). other statutory means such as virtual-statehood, i.e., designating the District a state for the purpose of voting representation. Congress has on numerous occasions considered legislation granting voting representation in the national legislature to District residents, but these attempts have failed to provide permanent voting representation for District residents.5 During the 103rd Congress (1993-1994), the District’s delegate along with delegates from the territories of the Virgin Islands, Guam, and American Samoa, and the resident commissioner from Puerto Rico were allowed to vote in the Committee of the Whole under amended House rules. Although the change was challenged in court as unconstitutional, it was upheld by the U.S. District Court in Michel v. Anderson, and affirmed by the Court of Appeals.6 Nevertheless, the new House Republican majority repealed the rule early in the 104th Congress. On January 24, 2007, the new Democratic majority of the House passed a rules change (H.Res. 78) allowing resident commissioners and delegates to vote in the Committee of the Whole, during the 110th Congress. Over the years, proposals to give the District voting representation in Congress have sought to achieve their purpose through a constitutional amendment, retrocession of part of the District back to Maryland, semi-retrocession allowing District residents to be treated like citizens of Maryland for the purpose of voting representation in Congress, statehood and virtual statehood that allow Congress to define the District as a state for the purpose of voting representation in Congress. Each is discussed below. measures directing Congress to provide for voting representation in Congress for the District apportioned as if it were a state. Initial Efforts. The idea of a constitutional amendment was first suggested in 1801, by Augustus Brevoort Woodward, in a pamphlet entitled “Considerations on the Government of the Territory of Columbia.”7 Although not a Member of Congress, Mr. Woodward, a landowner in the city of Washington, served as a member of the city council of Washington. His proposal to amend the Constitution would have entitled the District to one Senator and to a number of members in the House of Representative proportionate to the city’s population. The proposal, which was never formally introduced, may be found in Appendix A. It took another eighty-seven years before the first proposed constitutional amendment providing for voting representation in Congress for the District of Columbia was formally introduced by Senator Henry Blair of New Hampshire. During the 50th Congress, on April 3, 1888, Senator Blair introduced a resolution identical in its intent to that of the Woodward proposal of 1801. The Blair proposal was submitted on behalf of Appleton P. Clark and was accompanied by a letter which was printed in the Congressional Record.9 On April 5, 1888, the Senate Judiciary Committee was discharged from considering the resolution. Senator Blair reintroduced a modified version of the proposed amendment, S. J. Res. 82, on May 15, 1888. In the years between 1902 and 1917, several bills proposed constitutional amendments entitling the District to two Senators and representation in the House in accordance with its population. Although the Senate District Committee held a hearing on S. J. Res. 32, in 1916, the Senate took no further action on the resolution. Continued Efforts. In March 1967, Representative Emanuel Celler, chair of the House Judiciary Committee, introduced a legislative proposal on behalf of President Lyndon Johnson granting District residents voting representation in Congress. The proposal — H.J.Res. 396 — sought to authorize one voting Representative and granted Congress the authority to provide, through legislation, additional representation in the House and Senate, up to the number the District would be entitled were it a state. The House Committee on the Judiciary held hearings on the Johnson proposal, as well as others, in July and August 1967. On October 24, 1967, the Committee reported an amended version of the resolution to allow full voting representation for the District of Columbia: two Senators and the number of Representatives it would be entitled if it were a state. No other action was taken on the resolution during the 90th Congress. In 1970, the Senate Judiciary Subcommittee on Constitutional Amendments held hearings on two constitutional amendments (S.J.Res. 52 and S.J.Res. 56) granting voting representation in Congress to District residents, but did not vote on the measures. Instead, Congress passed H.R. 18725, which became P.L. 91-405, creating the position of nonvoting Delegate to Congress for the District in the House of Representatives. States Fail to Ratify Constitutional Amendment. In 1972 and 1976 constitutional amendments (H.J.Res. 253, 92nd Congress and H.J.Res. 280, 94th Congress), introduced by the District’s Delegate to Congress, Walter Fauntroy, granting voting representation to citizens of the District were reported to the House Judiciary Committee. Only the 1976 proposal reached the House floor where it was defeated by a vote 229-181. Representative Don Edwards reintroduced the proposed constitutional amendment as H.J.Res. 554 in the 95th Congress on July 25, 1977. It passed the House on March 2, 1978, by a 289-127 margin. On August 22, 1978, the Senate approved the resolution by a vote of 67-32. The proposed amendment, having been passed by at least two-thirds of each house, was sent to the states. The amendment provided that — for the purposes of electing members of the U.S. Senate and House of Representatives and presidential electors, and for ratifying amendments to the U.S. Constitution — the District of Columbia would be considered as if it were a state. Under the Constitution, a proposed amendment requires ratification by three-fourths of the states to take effect. In addition, Congress required state legislatures to act on ratification within seven-year of its passage.12 The D.C. Voting Rights Amendment was ratified by 16 states, but expired in 1985 without winning the support of the requisite 38 states. Renewed Efforts. On June 3, 1992, during the 102nd Congress, Representative James Moran introduced H.J.Res. 501, a proposed constitutional amendment declaring that the District, which constitutes the seat of government of the United States, be treated as a state for purposes of representation in Congress, election of the President and Vice President, and Article V of the Constitution, which delineates the process for amending the Constitution. The resolution was referred to the House Judiciary Committee, where no action was taken. Opponents of retrocession note that the adoption of such a measure could force Congress to consider the repeal of the 23rd Amendment to the Constitution, which grants District residents representation in the electoral college equivalent to the number of Senators and Representatives in Congress it would be entitled to if it were a state. If the amendment were not repealed, the net effect would be to grant a disproportionately large role in presidential elections to a relative small population residing in the federal enclave. the District was not a representative form of government as structured, and thus denies citizens of the nation’s capital the right of suffrage. the cession of land and Congress’s acceptance constituted a contract that could only be dissolved by all parties involved including the states of Maryland and Virginia, Congress, and the people of the District. The Bacon motion was defeated by a vote of 66 to 26. A year later, on March 17, 1804, Representative John Dawson introduced a similar provision that would have retroceded all of the Virginia portion of the Territory of Columbia to Virginia, and all but the city of Washington to Maryland. The House postponed a vote on the resolution until December 1804. On December 31, 1804, Representative Andrew Gregg called up the motion seeking retrocession of the District of Columbia to Virginia and Maryland. The House elected to postpone consideration of the resolution until January 7, 1805. During three days, from January 7 to 10, the House debated the merits of retroceding the District of Columbia to Virginia and Maryland, excluding the city of Washington. During the debate, concerns about the disenfranchisement of District residents and the democratic principle of no taxation without representation clashed with efforts to create an independent and freestanding federal territory as the seat of the national government. The House again rejected a resolution allowing for the retroceding of Maryland and Virginia lands. Virginia Retrocession. In 1840 and 1841, the citizens of Alexandria sought congressional action that would retrocede the area to Virginia. Five years later, on July 9, 1846, the District territory that lay west of the Potomac River was retroceded to Virginia by an act of Congress. The retroceded area represented about two-fifths of the area originally designated as the District. In 1848, Senator Stephen Douglas of Illinois submitted a resolution directing the District of Columbia Committee to inquire into the propriety of retroceding the District of Columbia to Maryland. The motion was agreed to by unanimous consent. Again, it was only a motion to study the question of retrocession. On January 22, 1849, Representative Thomas Flournoy introduced a motion that called for the suspension of the rules to enable him to introduce a bill that would retrocede to Maryland all of the District not occupied by public buildings or public grounds. The motion failed. On July 16, 1856, a bill (S. No. 382) was introduced by Senator Albert G. Brown directing the Committee on the District of Columbia to determine the sentiments of the citizens of the city of Georgetown on the question of retrocession to Maryland. The following year, on January 24, 1857, the Senate postponed further consideration of the measure after a brief debate concerning the language of the bill and its impact on consideration of any measure receding Georgetown to Maryland. Modern Era. Since the 88th Congress, a number of bills have been introduced that would retrocede all or part of the District to Maryland; none were successful. Most involved the creation of a federal enclave, the National Capital Service Area, comprising federal buildings and grounds under control of the federal government. In 1963, Representative Kyl, introduced H.R. 5564 in the 88th Congress, which was referred to the House District of Columbia Committee, but was not reported by the Committee. The measure would have retroceded 96% of the District to Maryland and created a federal enclave. On August 4, 1965, Representative Joel Broyhill of Virginia introduced a measure (H.R. 10264 in the 89th Congress) creating a federal enclave and retroceding a portion of the District to Maryland. Also, in 1965, the House District of Columbia Committee reported H.R. 10115, a bill combining the creation of a federal enclave, the retrocession of part of the District to Maryland, and home rule provisions. The bill was reported by the House District of Columbia Committee (H.Rept. 89-957) on September 3, 1965. It would have allowed the creation of a federal enclave, and retrocession of the remaining part of the city not included in the federal enclave, contingent on the state of Maryland’s acceptance. If the Maryland legislature failed to pass legislation accepting the retroceded area within one year, the District Board of Election would be empowered to conduct a referendum aimed at gauging support for the creation of a charter board or commission to determine the form of government for the outer city. The bill provided for congressional approval of any measure approved by the citizens of the affected area. On October 2, 1973, H.R. 10693, introduced by Representative Edith Green, included provisions retroceding the portion of the District ceded to the United States by Maryland. The bill would have retained congressional control over the federal enclave. If the retrocession provisions of the bill had been approved, Maryland would have been entitled to two additional United States Representatives for the area retroceded until the next congressional reapportionment. The bill also provided nine years of federal payments after retrocession to Maryland to defray expenses of supporting a newly established local government for the retroceded area. It was referred to the House District of Columbia Committee on October 2, 1973, but no further action was taken. Since the 101st Congress, eight bills have been introduced to retrocede some part of the District to Maryland.21 The bills would have maintained exclusive legislative authority and control by Congress over the National Capital Service Area (federal enclave) in the District of Columbia. Like their earlier counterparts no hearings or votes were held on these bills. Retrocession as a strategy for achieving voting representation in Congress for District residents arguably should address both political and constitutional issues and obstacles. The process would require not only the approval of Congress and the President, but also the approval of the State of Maryland and, perhaps, the voters of the retroceded area. Although the Supreme Court reviewed the question of retrocession in Phillips v. Payne,22 in 1875, it did not rule on its constitutionality. Short of retroceding all or a portion of the District to Maryland, a second option would allow District residents to be treated as citizens of Maryland for the purpose of voting in federal elections. Such an arrangement would allow District residents to vote as residents of Maryland in elections for the House of Representatives, and to have their vote counted in the election of the two Senators from Maryland This semi-retrocession arrangement would allow District residents to be considered inhabitants of Maryland for the purpose of determining eligibility to serve as a member of the House of Representatives or the Senate, but would not change their status regarding Congress’ exclusive legislative authority over the affairs of the District. The idea of semi-retrocession is reminiscent of the arrangement that existed between 1790 to 1800, the ten-year period between the creation and occupation of the District as the national capital. During this period residents of District residing on the respective Maryland and Virginia sides of the territory were allowed to vote in national elections as citizens of their respective states and in fact voted in the 1800 presidential election. Initial Efforts. Several bills have been introduced since 1970 to allow District residents to vote in Maryland’s congressional and presidential elections without retroceding the area to Maryland. During the 93rd Congress, on January 30, 1973, Representative Charles Wiggins introduced H.J.Res. 263, a proposed constitutional amendment would have considered the District a part of Maryland for the purpose of congressional apportionment and representation. Under this bill, District residents would have been subject to all the requirements of the laws of Maryland relating to the conduct of elections and voter qualification. The bill was referred to the House Committee on the Judiciary where no further action was taken. On March 6, 1990, Representative Stanford Parris introduced H.R. 4193, the National Capital Civil Rights Restoration Act of 1990. The bill would have given District residents the right to cast ballots in congressional elections as if they were residents of Maryland. It also would have maintained the District’s governmental structure, and was offered “as a workable way to change the [status quo] which represents taxation without representation” and as an alternative to a statehood measure, H.R. 51, introduced by Delegate Walter E. Fauntroy of the District of Columbia.23 District officials and some members of the House, most notably Representatives Constance Morella and Steny Hoyer, who represented the two Maryland congressional districts adjacent to the District of Columbia, opposed the bill. Opponents of H.R. 4193 argued that it was not a practical means of addressing the District’s lack of voting representation in Congress and that it could further cloud the District’s status. Both bills were referred to the House District of Columbia Committee, but received no further action. In defending the proposal, Representative Parris noted his opposition to statehood for the District and offered this explanation of his proposal in a letter published in the Washington Post on March 18, 1990. 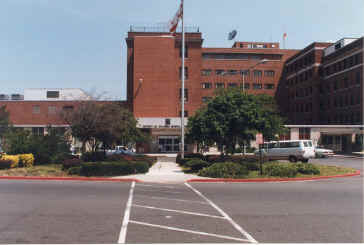 This approach would allow the government of the District to remain autonomous from the Maryland state government. D.C. residents would continue to vote for a mayor and a city council, and would not participate in Maryland elections for state positions such as delegate, state senator and governor. The reason for this is the constitutional mandate that the nation’s capital remain under the exclusive legislative jurisdiction of Congress. There is an important distinction between this action and the Voting Rights Constitutional Amendment proposed in 1978. That action, rejected by the states, called for the election of members of Congress from the District. It did not, as my proposal does, elect those members as part of the Maryland delegation. There is also a distinction between this and proposals simply to turn the District over to Maryland [retrocession]. With my proposal, there is no need to delineate the federal enclave, and there would not be a requirement to obtain the approval of the Maryland legislature. I do not propose this because the push for statehood might pass; on the contrary, I am certain that given the political and practical problems facing the District, the unconstitutionality of statehood, and the positions taken by members of Congress during the most recent statehood debate, that statehood would not pass. Representative Parris contended that the proposal did not require the approval of the Maryland legislature or a referendum vote by District citizens. The proposal did raise questions of constitutional law, apportionment, and House procedure. It would have provided Maryland one additional seat in the House of Representatives, increased the size of the House temporarily until the 2000 reapportionment and allowed the District’s Delegate to Congress to serve as a member of the House of Representatives from Maryland until the date of the first general election occurring after the effective date of the act. allow citizens in the District to vote as Maryland residents in elections for President and Vice President. Can Congress, without the consent of the state, require the state of Maryland to administer or supervise federal elections in the District? Does transferring administrative authority and associated costs for federal elections in the District to the state of Maryland constitute an unfunded mandate? Who should bear the additional cost of conducting federal elections in the District? Does the measure require an affirmative vote of the citizens of Maryland or the Maryland legislature? Semi-retrocession arguably rests on uncertain ground. The constitutionality of the concept has not been tested in the courts. Semi-retrocession raises questions relating to state sovereignty and the power of Congress to define state residency for the purpose of voting representation in the national legislature. Further, since the proposal does not make the District a state, it might violate Article 1, Section 2 of the Constitution and the 14th Amendment to the Constitution. Article 1, Section 2 requires Representatives to be chosen from the states. The 14th Amendment is the basis for the “one-person, one-vote” rule for defining and apportioning congressional districts in the states. New States may be admitted by the Congress into this Union; but no new State shall be formed or erected within the jurisdiction of any other State; nor any State be formed by the junction of two or more States, or Parts of the States, without the consent of the legislatures of the States concerned as well as of the Congress. Some opponents of statehood contend that this article implies that the consent of Maryland would be necessary to create a new state out of its former territory. They note that Maryland ceded the land for the creation of a national capital. This could raise a constitutional question concerning whether Maryland could object to the creation of another state out of territory ceded to the Untied States for the creation of the national seat of government, the District of Columbia. In addition, it could be argued that the granting of statehood for the District would violate Article I, Section 8, Clause 17, which gives Congress exclusive legislative control of the District. Because of these constitutional issues, most statehood proposals for the District have sought to achieve statehood through the constitutional amendment process. Granting statehood to the District of Columbia would settle the question of congressional representation for District residents. A ratified constitutional amendment granting statehood to the District would entitle the District to full voting representation in Congress. As citizens of a state, District residents would elect two Senators and at least one Representative, depending on population. Modern History. In 1983, when it became evident that H.J.Res. 554 — a proposed constitutional amendment granting voting rights to District residents —would fail to win the 38 state votes needed for ratification, District leaders embraced the concept of statehood for the District of Columbia. The statehood effort, however, can be traced back to1921.25 Statehood legislation in Congress has centered around making the non-federal land in the District the nation’s 51st state. Several supporters of voting representation in Congress for District residents believe that statehood is the only way for citizens of the District to achieve full congressional representation. Since 1983, there has been a continuing effort to bring statehood to the District — an effort that was most intense from 1987 through 1993. Since the 98th Congress, 13 statehood bills have been introduced.26 On two occasions, House bills were reported out of the committee of jurisdiction, resulting in one floor vote. D.C. Delegate Walter E. Fauntroy introduced H.R. 51, 100th Congress, in 1987 to create a state that would have encompassed only the non-federal land in the District of Columbia. While the bill was reported out of the House District of Columbia Committee, no vote was taken on the House floor. On a second statehood bill, H.R. 51, introduced by Delegate Eleanor Holmes Norton in the 103rd Congress, in 1993, the measure was reported from the Committee on the District of Columbia, and a vote was taken on the House floor on November 21, 1993, with a tally of 277-153 against passage. On July 14, 1998, during the 105th Congress, Delegate Eleanor Holmes Norton introduced H.R. 4208, a bill providing full voting representation in Congress for the District of Columbia. The bill was referred to the Committee on Judiciary, Subcommittee on the Constitution, where no action was taken. The bill was noteworthy in that it did not prescribe methods by which voting representation was to be obtained such as a constitutional amendment. Nor did the Norton bill include language typically found in other measures that defined or declared the District a state for the purpose of voting representation in Congress. The measure suggested that Congress might provide voting representation by statute, a constitutionally untested proposition. During the 109th Congress two bills were introduced that sought to provide voting representation to the citizens of the District of Columbia by eschewing methods used in the past such as a constitutional amendment, retrocession, semi-retrocession and statehood. The bills would have provided District citizens with voting rights in Congress by designating the District as a state (virtual statehood) or by designating the District as a congressional district. Virtual Statehood. Much of the latest thinking on securing voting rights for citizen’s of the District centers on the premise that Congress has the power to define the District as a state for the purpose of granting voting representation. Proponents of virtual statehood note that the District is routinely identified as a state for the purpose of intergovernmental grant transfers, that Congress’ authority to define the District as a state under other provisions of the Constitution has withstood Court challenges,27 and that Congress has passed legislation allowing citizens of the United States residing outside the country to vote in congressional elections in their last state of residence.28 They also note that the Constitution gives Congress exclusive legislative control over the affairs of the District and thus the power to define the District as a state. Opponents argue that the District lacks the essential elements of statehood, principally an autonomous state legislature, charged with setting the time, place and manner for holding congressional elections. permanently increased the size of the House from 435 to 436 for the purpose of future reapportionment. The proposal raised several questions, chief among them, whether Congress has the legal authority to give voting representation to District residents. The bill differed significantly from the other measures introduced in during the 109th Congress. H.R. 398 would have provided citizens of the District with voting representation in both the House and the Senate, unlike the other measures which would provide representation only in the House. permanently increased the number of members of the House of Representative from 435 to 437. One of the two additional seats would be occupied by a Representative of the District of Columbia; the other would be elected at- large from the state of Utah based on 2000 decennial census of the population and apportionment calculations which placed Utah in the 436 position. This is one seat short of the 435 seats maximum size of the House. The bill was also referred to the House Judiciary Committee, Subcommittee on the Constitution, which held a hearing on the bill on September 14, 2006, but did not report it out of committee. Under the bill, both new Members would have full voting rights, allowing the Member to vote in committee and on the House floor. H.R. 5388 was among the most recent in a long series of efforts aimed at giving District residents voting representation in Congress, a series that extends back to 1801 —only two years after the ratification of the Constitution in 1789. The idea of an at-large District raised questions about the measure’s constitutionality. In response, on December 4, 2006, the Utah legislature approved by a vote of 23 to 4 in the Senate and 51 to 9 in the House, a redistricting map creating a 4th congressional district for the state. The move was seen by supporters of voting rights for the District as removing a significant impediment to the bill’s consideration by the full House of Representatives during the 109th Congress. However, a floor vote on the measure was not possible before the 109th Congress adjourned following the 2006 congressional elections. On January 9, 2007, Delegate Eleanor Holmes Norton and Representative Tom Davis introduced H.R. 328, which includes many of the same provisions included in H.R. 5388. The bill does not include the most controversial provision included in H.R. 5388, namely, the creation of an at-large congressional district for Utah. Instead, the bill requires Utah to create a fourth congressional district. Over the two hundred year history of the Republic, citizens of the District of Columbia have sought political and judicial redress in their efforts to secure voting representation in Congress. In 2000, the Supreme Court affirmed a decision by a three-judge panel of the United States District Court of the District of Columbia in the case of Adams v. Clinton,30 which rejected a petition from District residents seeking judicial redress in their effort to secure voting representation in the national legislature. The Court ruled that District residents did not have a constitutional right to voting representation in Congress, but Congress has the power to grant voting rights to District residents through the political process including options outlined in this report. Any of the options outlined in this report must be able to withstand political and constitutional challenges. Some, such as a constitutional amendment or retrocession are more problematic than others. Others such as statehood, which can be achieved by statute, may trigger other constitutional issues. All must overcome what some observers consider conflicting provisions of the Constitution. Namely, Art. 1, Sec. 2, of the Constitution which states that the House of Representative shall be composed of members chosen every two years by the people of the several states and Art. 1, Sec. 8, Clause 17 which conveys exclusive legislative authority in all cases whatsoever over the affairs of the District of Columbia. two-thirds of the state legislatures may call for a Constitutional Convention for the consideration of one or more amendments to the Constitution. If approved, the amendments must be ratified by three-fourths of the states (38 states) in a state convention or by a vote of the state legislatures. The amendment process could take years and prove unsuccessful, as was the case with the D.C. Voting Rights Amendment of 1978, which was ratified by 16 states, but expired in 1985 without winning the support of the requisite 38 states. Semi-retrocession bills would result in a unique arrangement between citizens of the District of Columbia and Maryland. Such bills would allow District residents to vote in Maryland congressional elections based in part on the theory of residual citizenship, that is the idea that District residents retained residual rights as citizens of Maryland, including voting rights after the land creating District was ceded to the federal government. The theory was rejected by the Supreme Court. In Albaugh v. Tawes,32 the Supreme Court rejected the contention that District residents retained residual rights as citizens of Maryland, specifically, the right to vote in Maryland. The case involved a Republican candidate who lost the nomination election for the United States Senate. The candidate, William Albaugh, filed suit seeking a judgment declaring the District a part of Maryland and ordering Maryland state officials (the Governor and the Secretary of State ) to declare the primary and any future elections voided because District residents did not vote. The Court held that District residents had no right to vote in Maryland elections. Statehood is a much simpler process, but it is no less politically sensitive. Article IV of the Constitution gives Congress the power to admit new states into the Union. The Article does not prescribe the method, and the process has varied over time. Congress could by statute, convey statehood to some portion of the District. It must be noted that if Congress conveyed statehood on what is now the District, a portion of the District would have to remain a federal enclave since Article I, Sec. 8, Clause 17, of the Constitution requires a portion of the District, not exceeding ten square miles, to be maintained as the “Seat of Government of the United States.” The statehood option should include Congress introducing a constitutional amendment repealing the 23rd Amendment granting District residents three votes in the Electoral College. Observers argue that if the amendment is not repealed it could result in conveying significant political power in presidential elections to the few District residents remaining in the federal enclave. Bills that would convey voting rights to the District Delegate to Congress by defining the District as a state (virtual- statehood and other means) may conflict with Article I, Sec. 2, of the Constitution which conveys voting rights to representatives of the several states. Despite the constraints of Article 1, Sec. 2, advocates of voting rights for District residents contend that the District Clause (Art. 1, Sec. 8) gives Congress the power to define the District as a state. As Congress has never granted the Delegate from the District of Columbia a vote in the full House or Senate, the constitutionality of such legislation has not been before the courts. In general however, courts such as the three-judge panel in Adams v. Clinton33 have not looked favorably upon the argument that the District of Columbia should be considered a state for purposes of representation in the Congress. Some commentators have suggested that Congress, acting under its authority over the District, has the power to confer such representation,34 Other commentators, however, have disputed this argument.35 In addition, District voting rights proponents can point to the Uniform and Overseas Citizens Absentees Voting Act, as an example of Congress’ authority to provide voting rights to citizens who are not residents of a state. A full analysis of these legal arguments can be found at CRS Report RL33824, The Constitutionality of Awarding the Delegate for the District of Columbia a Vote in the House of Representatives or the Committee of the Whole, by Kenneth R. Thomas. Resolved that the following be recommended to the Legislatures of the several states as an Article in addition to, and amendment of the constitution of the United States. In 2005, the District passed legislation that some analysts consider a circumvention of Congress’ prohibition on the use of District funds to advocate for voting representation in Congress for citizens of the District of Columbia. On July 6, 2005, the Council of the District of Columbia unanimously approved the “Fiscal Year 2006 Budget Support Emergency Act of 2005” (A16-0168). The act included as subtitle F of Title I, the “Support for Voting Rights Educational-Informational Activities Emergency Act of 2005,” which appropriated $1 million in local funds to the Executive Office of the Mayor to support “educational and informational activities to apprise the general pubic of the lack of voting rights in the United Sates Congress for District residents.”38 Language of the act aimed at drawing a distinction between “educational and informational activities” and advocacy activities in support voting rights for District residents. In fact, Section 1026(b) of the act prohibits funds from being used to support lobbying activities in support of voting rights for District residents. On April 5, 2006, the Mayor identified three entities who received a share of the $1 million to be used to conduct voter education activities. They included DC Vote ($500,000), The League of Women Voters of the District of Columbia ($200,00) and Our Nation’s Capital ($300,000). 1 Historians often point to the forced adjournment of the Continental Congress while meeting in Philadelphia on June 21, 1783, as the impetus for the creation of a federal district. Congress was forced to adjourn after being menaced for four days by a mob of former soldiers demanding back pay and debt relief. Although the Congress sought assistance and protection from the Governor of Pennsylvania and the state militia, none was forthcoming. When the Congress reconvened in Princeton, New Jersey, much was made of the need for a federal territory whose protection was not dependent on any state. U.S. Congress, Senate, A Manual on the Origin and Development of Washington, S. Doc. 178, 75th Cong., 3rd sess., prepared by H. Paul Caemmerer (Washington. GPO, 1939) pp.2-3. 2 In 1788, Maryland approved legislation ceding land to Congress for the creation of a federal district. One year later, Virginia passed a similar act. On July 16, 1790, Congress approved the Residence Act, “an act establishing the temporary (Philadelphia) and permanent seat of the Government of the United States” along the Potomac. 3 Congresses have prohibited the D.C. government from using federal or District funds to support lobbying for such representation. The prohibition is discussed in Appendix B of this report. 4 Augustus Brevoort Woodward, Considerations on the Government of the Territory of Columbia [Paper No. I of 1801]. Quoted in Theodore Noyes, Our National Capital and Its Un-Americanized Americans (Washington, DC: Press of Judd & Detweiler, Inc., 1951) p. 60. Hereafter cited as Woodward, quoted in Noyes. 5 Congress twice approved legislation allowing the District of Columbia to elect a nonvoting Delegate to Congress. From 1871 to 1874, Congress established a territorial form of government for the District with the passage of 16 Stat.419. The new government authorized the election of a non-voting delegate to represent the District in the House. Congress abolished this arrangement in the aftermath of a fiscal crisis. In 1970, Congress enacted P.L. 91-405 (H.R. 18725, 91st Congress) creating the position of Delegate to the House. 6 Michel v. Anderson, 817 F. Supp. 126 (D.D.C. 1993), affirmed, 14 F.3d 623 (D.C. Cir. 1994). 7 Woodward, quoted in Noyes, passim. 8 Woodward, quoted in Noyes, p. 195. 9 Senator Henry Blair, Remarks in the Senate, Congressional Record, vol. XIX, April 3, 1888, p. 2637. 10 Senator Henry Blair, Remarks in the Senate, Congressional Record , vol XXI, September 17, 1890, p. 10122. 12 The seven-year period does not appear in the Constitution, but it has become customary over time. 13 Annals of Congress, 7th Congress, 2d Sess., Dec. 6, 1803 to March 3, 1803 and Appendix. (Washington, 1803) p. 486-491 and 494-510. 14 U.S. Congress, Journal of the House of Representatives. 41st Cong. 2nd sess. (Washington, Dec. 13, 1969) pp. 57-58. 15 92 U.S. 130 (1875). 16 Sen. James McMillan, “Original District of Columbia Territory,” remarks in the Senate, Congressional Record , vol. XXIX, Dec. 17, 1896. p. 232. 17 Amos B. Casselman, The Virginia Portion of the District of Columbia, Records of the Columbia Historical Society, vol. 12. (Washington, read before the Society, Dec. 6, 1909) pp. 133-135. 18 Sen. James McMillan. “Introduction of Resolution (SR 50) Regarding Constitutionality of Virginia Retrocession,” remarks in the Senate, Congressional Record, vol. XXXV, Feb. 5, 1902, p. 1319. 19 U.S. Congress, Senate. “Retrocession of a Portion of the District of Columbia to Virginia,” Congressional Record, vol. XXXV. p. 3973. 20 U.S. Congress, Congressional Globe, Sketches of Debates and Proceedings, 25th Cong., 2nd sess, (Washington: 1838) pp. 297, 493. 21 Rep. Regula has introduced a retrocession bill in every Congress since the 101st Congress. These include H.R. 4195 (101st Congress); H.R. 1204 (102nd Congress); H.R. 1205 (103rd Congress); H.R. 1028 (104th Congress); H.R. 831 (105th Congress); H.R. 558 (106th Congress); H.R. 810 (107th Congress); and H.R. 381 (108th Congress). 22 92 U.S. 130 (1875). 23 H.R. 51 had 61 cosponsors in the House. A companion bill was introduced in the Senate, S. 2647 by Sen. Kennedy with five cosponsors. H.R. 4193 had three cosponsors in the House, but no companion bill in the Senate. 24 Rep. Stanford Parris. “Voting Rights, Yes, A New Status, No.” The Washington Post, March 18, 1980. p. b8. 25 In November and December 1921, and January 1922, during the 67th Congress, the Senate held hearings on S.J.Res. 133, which would have granted statehood to the District. 26 In the 98th Congress, Del. Fauntroy introduced H.R. 3861 on Sept. 12, 1983, and Sen. Kennedy introduced S. 2672 on May 15, 1984. In the 99th Congress, Del. Fauntroy introduced H.R. 325 on Jan. 3, 1985; Sen. Kennedy introduced S. 293 on Jan. 24, 1985. In the 100th Congress, Del. Fauntroy introduced H.R. 51 on Jan. 6, 1987; Sen. Kennedy introduced S. 863 on March 26, 1987. In the 101st Congress, Del. Fauntroy introduced H.R. 51 on Jan. 3, 1989; Sen. Kennedy introduced S. 2647 on May 17, 1990. In the 102nd Congress, Del. Norton introduced H.R. 2482 on May 29, 1991; Sen. Kennedy introduced S. 2023 on Nov. 22, 1991. In the 103rd Congress, Del. Norton introduced H.R. 51 on Jan. 5, 1993; Sen. Kennedy introduced S. 898 on May 5, 1993. In the 104th Congress, Del. Norton introduced H.R. 51 on Jan. 4, 1995. 27 See Stoutenburg v. Hennick, 129 U.S. 141 (1889) (Art. 1, Sec. 8, Clause 3— Commerce Clause); Callan v. Wilson, 127 U.S. 540, 548 (1988) (Sixth Amendment— District residents are entitled to trial by jury). 28 The Uniform and Overseas Citizens Absentee Voting Act, 100 Stat. 924. 29 Kenneth C. Martis. Congressional Districts in The Historical Atlas of United States Congressional Districts: 1789-1993 (New York, NY, The Free Press, 1982) p. 5. 30 90 F. Supp. 2d 35 (D.D.C.2000), affirmed sub nom. Alexander v. Mineta, 531 U.S. 940 (2000)(cites to later proceedings omitted). 31 92 U.S. 130 (1875). 32 379 U.S. 27 (1964). 33 90 F. Supp. 2d 35 (D.D.C.2000), affirmed sub nom. Alexander v. Mineta, 531 U.S. 940 (2000). 35 See, e.g., District of Columbia Fair and Equal House Voting Rights Act of 2006, before the Subcommittee on the Constitution, H.R. 5388, 109th Cong., 2nd Sess. 61 (testimony of Professor Jonathon Turley). 36 Woodward, Proposed Constitutional Amendment of 1801, quoted in Noyes, p. 204. 38 Section 1026, Subtitle F, Title I of A16-0168. Text available at [http://www.dccouncil .washington.dc.us/images/00001/20050726174031.pdf].